In this project, we develop specific machine learning methods for identifying an underlying functional form that gave rise to data. In particular for mechanical systems which are governed by the laws of physics, if we can learn the actual equations then accurate predictions outside of the domain of the available data can be made, i.e. we are able to extrapolate. 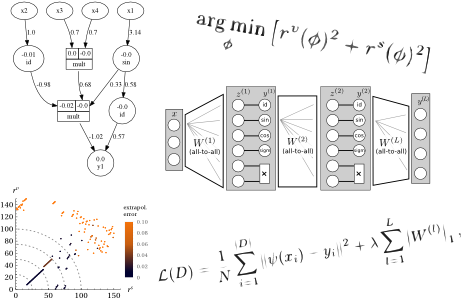 Our current approach uses a modified feed-forward network with sine, cosine, identity and multiplicative units (with two terms) and a particular regularization and model selection scheme.